Materials: 3 hanks of Glamournacor 7650 yarn (55% cotton, 45% viscose, 100 g / 223 m.), Circular needles 4.0 mm. 80 cm long, hook 2.0 mm. Coquette: 4.0 mm knitting needles. Dial 120 loops. Continue knitting the coquette according to the pattern, repeating the repeat of the 12-loop pattern 10 times in width. At a height of 19 cm. You will get 240 loops on the needles. Back and front: knit the first 62 loops in front, close the next 58 loops for the right armhole, knit the next 62 loops of the back, close the last 58 loops of the left armhole, join into a ring. In the next row, collect new 10 loops at the places of each armhole (i.e., over closed loops). 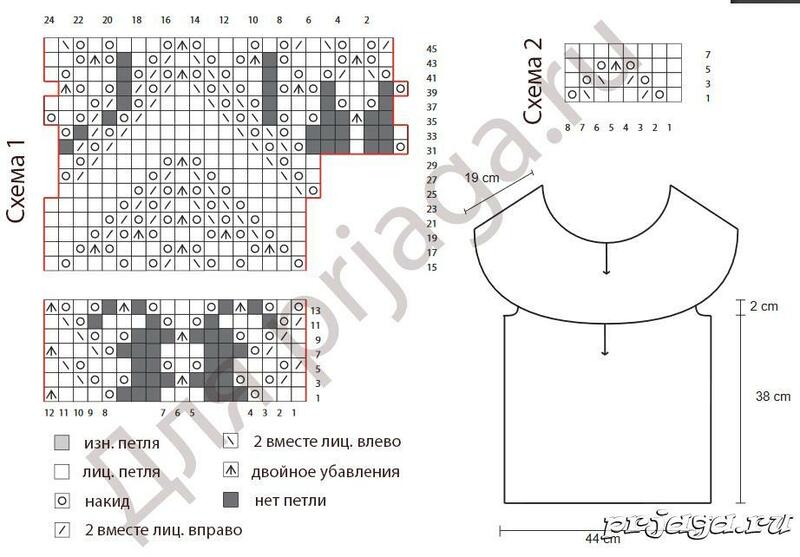 Continue knitting pattern 2, repeating the pattern repeat 18 times the width of the row. At a height of 36 loops from the joint, knit 6 rows of garter knitting, alternating 1 row of purl and 1 row with facial loops. Tie armholes with crochet eyelets.